Release Date: April 13th, 2006 (Two Boots Pioneer Theater) by The 7th Floor. DVD Release Date: July 25th, 2006. The Cast: Rob Corddry, Paul Sheer, Dannah Feinglass, Rob Riggle, Curtis Gwinn, Seth Morris, Rob Huebel, Jamie Denbo, D.J. Hazard, Jack McBrayer, Owen Burke, Neil Driscoll Jr., Billy Merritt, Ed Helms, Andrew Secunda, Sean Conroy. 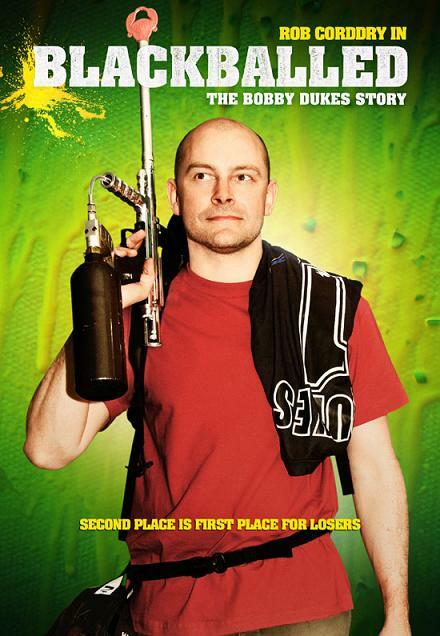 BASIC PREMISE: Bobby Dukes (Corddry) returns to his paintball team after being banned for cheating ten years earlier. ENTERTAINMENT VALUE: The film opens with a fight between plastic toys which simulates the catalytic event which led Bobby Dukes to be banned from his paintball team: he was caught “wiping” the paint off of his shirt during a game. Now, ten years later, when the ban of wiping finally gets lifted, he comes back to get a second chance. In its mockumentary style, Blackballed brings plenty of laughs for all those who like silly humor. How can a movie about paintball be so damn funny? The answer is quite simple: much of the laughs come from the actors who not only have great comic energy when they need it, but also show restraint when they need to be serious—as if this were a real documentary. Rob Corddry, from The Daily Show knows how to be seriously funny as Bobby Dukes. Co-writer/director Brant Sersen along with co-writer Brian Steinberg come up with some laugh-out-loud lines without crossing too many boundaries of gross-out, offensive humor—after all, this isn’t Jackass: The Movie. Whether or not you like playing paintball, Blackball is irresistibly fun to watch from start to finish. IN A NUTSHELL: "Paintfully" funny! A comic gem! It’s like a Christopher Guest movie for the Old School crowd!